The potential of carbon capture and storage (CCS, also known as carbon sequestration) for the removal of large volumes of CO2 from power stations and factories prior to its release into the atmosphere, depends on suitable reservoir and trap that will maintain seal integrity over thousands of years. Not surprisingly then, a successful CSS strategy relies on many aspects of geoscience that have been developed over decades of hydrocarbon exploration and production – including fracture network characterisation, fault seal analysis, structural trap appraisal, and geomechanics. £4m project to assess of the overall UK carbon dioxide storage capacity in offshore geological formations (joint project together with LR Senergy Ltd, BGS, Scottish Centre for Carbon Storage, Durham University, GeoPressure Technology Ltd, Imperial College London, RPS Energy and Element Energy Ltd). The UK’s first carbon dioxide storage appraisal database, enabling more informed decisions on the economics of CO2 storage opportunities. 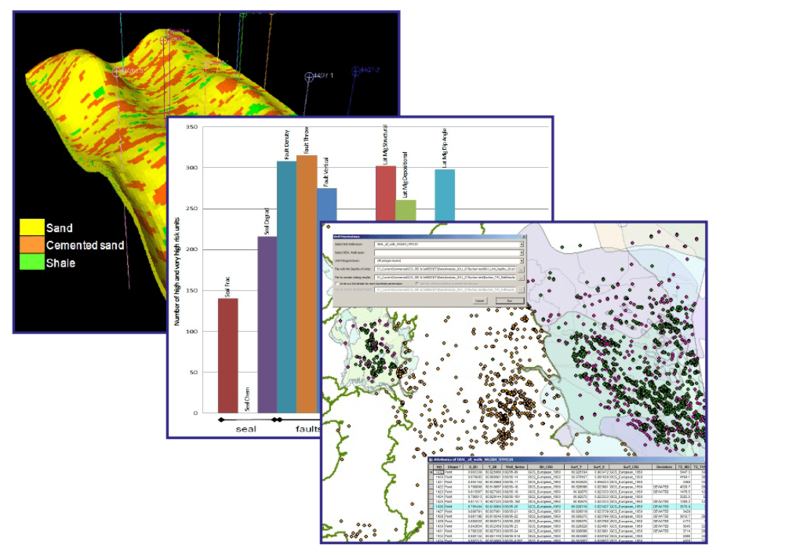 GIS, geospatial analysis, analysis of production data, reservoir characterisation, risking. Client: One North East and supporting energy companies. Potential sites for CO2 storage, Northern Permian Basin, offshore UK. Dynamic modelling of CO2 storage in a saline aquifer (consistent with EU directive 2009/31/EC), and improved modelling of the interaction between CO2 and fractures. 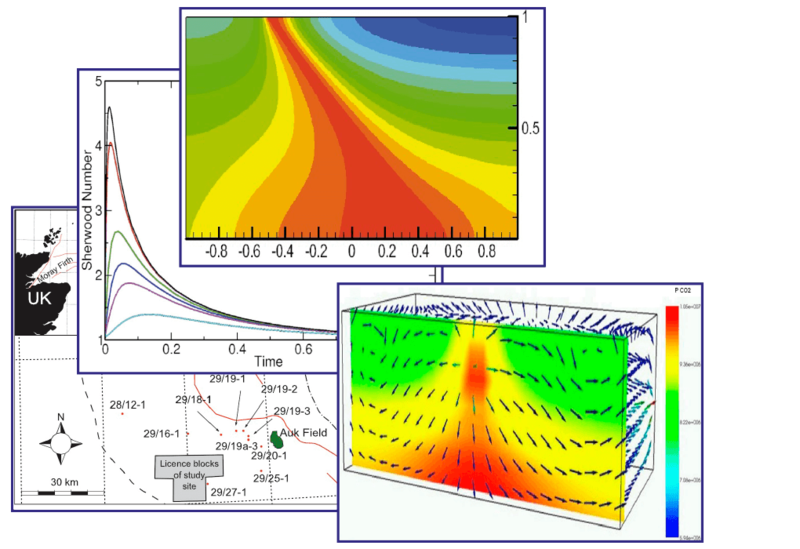 Numerical modelling, reservoir modelling, fractures & fluid flow. Watson et al. 2010, 2011, 2012, 2014. (See also Gluyas & Daniels 2010, Jones et al. 2011, Mathias & Roberts 2013). This work is a nice example of technology crossover – we’ve applied our tried-and-tested geospatial technology and equipment to help tackle new research issues that are quite different to our own core areas of geoscience expertise. 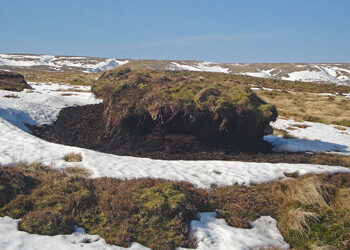 Within the UK, blanket bogs act as the largest terrestrial store of carbon, and supply ca. 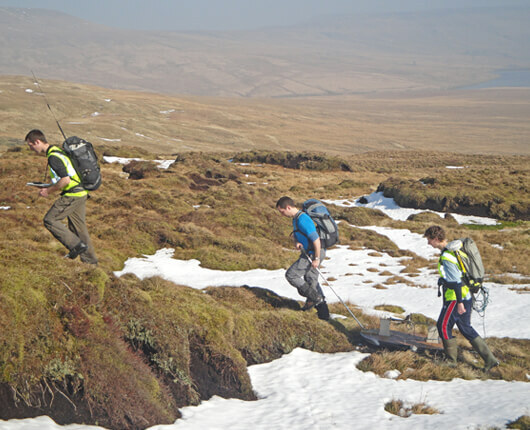 70% of drinking water, so quantifying the thickness and extent of peat and understanding erosional processes that effect peat are of major importance. Clients: Lancashire Wildlife Trust, Yorkshire Wildlife Trust, Leeds University. Upland peat bogs in northern and central Pennines, and lowland bogs near Manchester. Quantification of the thickness and/or surface topology of areas of peat cover. Ground penetrating radar (GPR), terrestrial lidar, dGPS. Grayson et al. 2012, Vsemirnova et al. 2013. 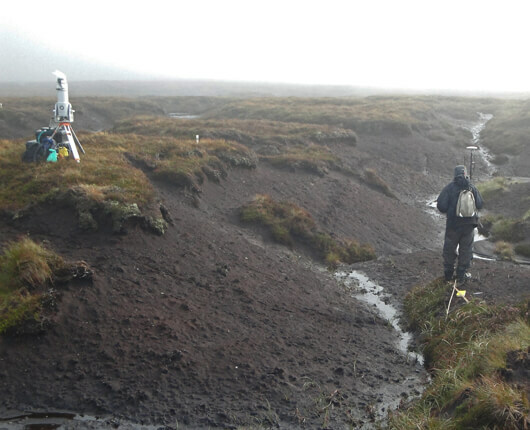 Acquiring ground penetrating radar (GPR) and RTK dGPS from areas of blanket bog in North Yorkshire. Acquiring lidar and dGPS from areas of bare peat erosion, northern Pennines (see Grayson et al. 2012). 2D ground penetrating radar data (see Vsemirnova et al. 2013). 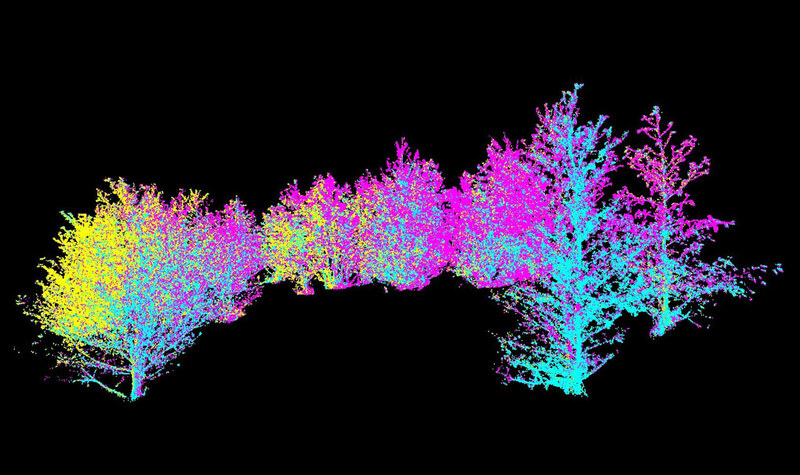 As part of a long-term research program to improve numerical modelling of weather and climate, we’ve used geospatial technologies to help characterise tree canopies in detail. This has enhanced understanding of the interaction between snow melt and land cover type, in order to improve land surface models that are used in predictions of climate and water availability. Client: Edinburgh, Newcastle, Northumbria and Durham Universities, funded by the Natural Environment Research Council (NERC). High latitude forest sites in Arctic Sweden and Finland. Detailed measurements of the full structure of the forest canopy. Terrestrial lidar, hemispherical photography, GPS. Reid et al. 2014, Hancock et al. 2014. 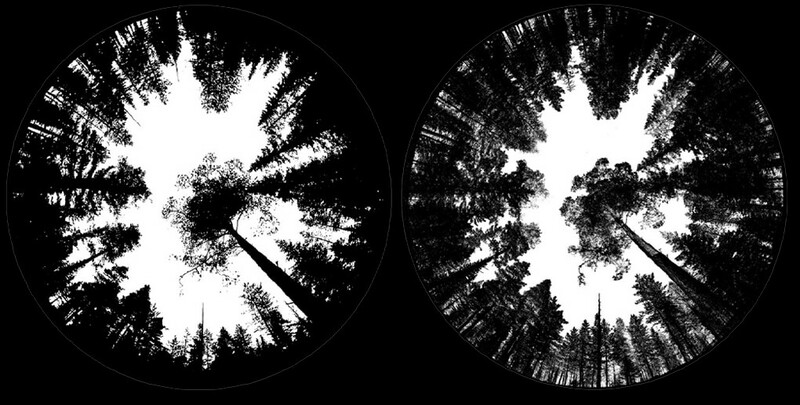 Imaging the tree canopy: comparison of hemispherical photo (left) and lidar (right). From Hancock et al. 2014. 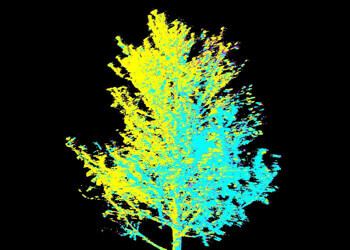 Lidar point cloud of stand of trees. 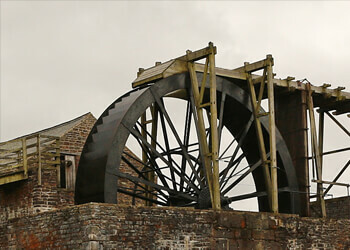 We have close collaboration with another spin-out company from the University, Geoenergy Durham, who have a wide portfolio of commercial projects in a range of energy technologies, including geothermal, carbon capture and storage, clean coal, enhanced oil recovery, unconventional hydrocarbons and others. 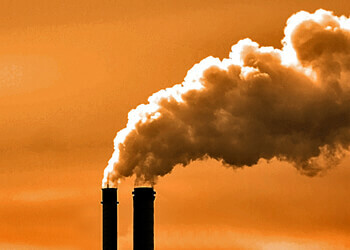 Global project portfolio encompassing a wide variety of fossil and non-fossil energy sectors. Very extensive experience of the energy sector. Broad range of applied geoscience. Charlotte Adams, Jon Gluyas, Theresa Jezierski. (See also Gluyas & Daniels 2010, Jones et al 2017).